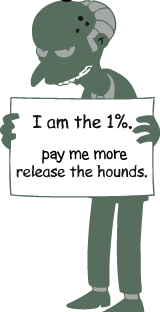 I was sent a article from the NY Times about how CEO pay is skyrocketing in spite of efforts of the "occupy" movement to raise awareness of the disparity between CEO pay and rank and file workers. This article made me wonder "How often do CEOs jump ship for larger pay?" Shouldn't CEO's get paid every cent they're worth? That's a vague statement, as a quote from the article stuck out from front line workers "Why should I kill myself to get a 2 percent raise if the C.E.O. is going to get a 20 percent raise?" The main justification for the huge pay increases is that it keeps CEOs in place and prevents them from jumping ship. This may be true in some cases, but shouldn't there be a published study about the topic before corporate boards make wild assertions that glorify huge packages for CEOs and imply a level of worthlessness to the average worker? 1) How often do CEOs jump ship for larger pay? 2) How successful are the companies who land CEOs who repeated jump for higher pay? 4) Do CEOs jump to go to a better company or a chance to make more money? 5) What is value creation equation when setting pay for CEOs? 6) When is it financially prudent to let a CEO jump since the pay required no longer makes sense? My guess is that there will never be such a study, as there is no accountability for the people setting the pay package. When there's a bad hire, it's easy to say "we didn't pay enough for the right talent" than to answer some harder questions. That said, a brief thought experiment is in order. What if CEO pay was capped at $5M or even $1M/year plus unlimited discretionary options for long term restricted stock? You could have the potential for unlimited pay, but remove the incentive for jumping ship. Would you still see CEOs jumping around? Would you see longer tenures when the shorter term incentives are reduced?